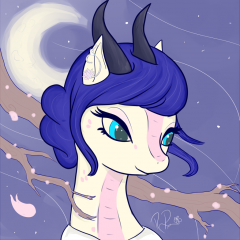 I wanted to draw something for Canterlot, so this is what I came up with! 17 users participated in this besides me, I'm actually surprised this many people joined in. Overall I like this, I had a lot of fun drawing this many OCs! Maybe I'll do another one of these next year. I'll put all the solo pics for those who have asked for one in the request thread soon. Thanks to to all the participants! Copyrights down below! 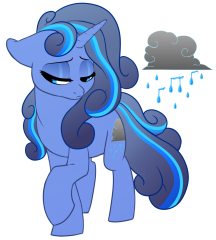 © PrinceoftheNight, PrinceBlueblood, Shadowbolt01, Dio, XanXeto, tacobob, Pyroblaze, Dunder, Bellosh, Windwright, DreamySunday, DerpRavener, Zeig, Rosewind, Dubstep, Lyipheoryia, Mojo. From the album: Muddy's Album! Just something I doodled whilst a fair few of us were spitballing ideas in Discord. Moths can be surprisingly colourful. It's been a while since I've drawn anything pony wise and the Long Ma/Qilin just look like a rad design thing anyway. Have a sweet girl. In the vein of Bevel and Presteza I suppose I'm adding toboe to the list of characters of mine who've had a redesign. I felt like I'd improved a bit with my wolf and canine drawing since I first posted Toboe's True form as an Okami, so I decided to see if I could give her a nice, more streamlined look. Feedback would be appreciated. Just kinda felt like drawing something cute and simple, so here's a baby Ochiru, how she might have looked right after her cherry blossom grove first bloomed. Featuring special summer edition! 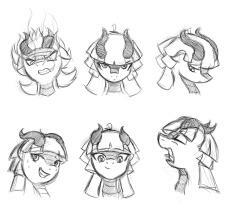 I like to think the mask that serves as her face was able to mimic facial expressions so that her feelings could be conveyed like a normal pony/Yokai, but it became blank and still after her grove was destroyed. So now she has a perpetually empty expression on her face. Maybe if she ever gets some of her power back though, her mask will be able to smile like this again. Or, as she's called nowadays, Ochiru. I honestly wasn't expecting to app another character when I started designing this. I got in a discussion with someone the other day about Wolf Yokai designs, and I started wondering to myself how I might design another Okami - how I might use one or two elements from my first design, but change it up to make it look unique in and of itself, so that Kakushi's design didn't look like straight template/basis for a new design. I ended up liking it enough to app a whole new character. I probably like it more than Kakushi's design, because the mask on this one gives it a more uneasy feeling, like something's not quite right about her (at least in my own opinion). 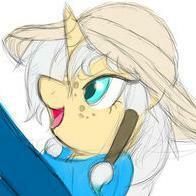 Hopefully I'll get a chance to start RPing her soon - should be fun! I'm wrking n an app for Bevel in the EQG verse run by steel. That is all. The life a Ronin is not easy, but it's the life Hanari Rua chose. Just some art for an upcoming OC I'm working on. Here's the first chibi! I really love this guy's colors. 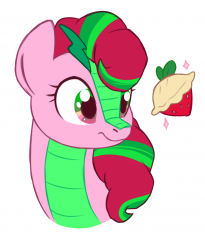 I didn't add a cutie mark because I figured it would be covered up by the wing, but looking at it now I think I'd be able to squeeze one in. Let me know if you want me to add one! Fēng belongs to PrinceBlueblood . Painted in FireAlpaca. Quick doodle of Yù Liánhuā's adopted mom whose name basically translates to 'Strawberry Dumpling'. Everyone meet Astrid! 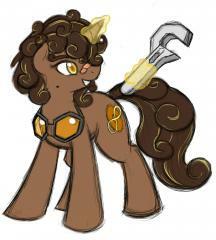 the latest (for now) addition to my OC lineup. The High King of Whitescar is currently busy dealing with a multitude of issues back home in the lands of caribou. In the hopes of a united Whitescar that can grow beyond the image all other nations have of their kind as berserking barbarian conquerers and nothing else, HIgh Queen Astrid has been hoping to do more diplomatic work with the adjacents lands... Maybe Neighpon if she thinks that their inhabitants are over that whole... war thing that was a long time ago. She's getting up there in age along with her Husband, Havardr, but also like her beloved she has not let it slow her down. She's an experienced warrior but also one of the best healers and potion makers in her homeland. She'll likely be venturing outside fo whitescar and visiting certain areas of lands beyond in order to meet both creatures of note and those they rule over... and maybe adding to her collection of pulp stories. 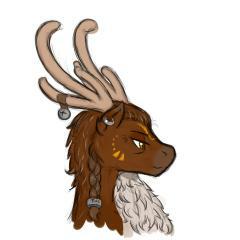 The drawing itself was a fun to do... although I still think the antlers are a bit goofy looking. "Is it not to your liking?" Empress Yu Yue? More like Empress Yu Yu-bae! (Somebody please put me out of my misery) Check out that ear! What a piercing she'll have, courtesy of your friendly vagabond peryton trash! Nothing like a friendly poke from Lucy. Woooooah now. Been a long while since I uploaded one of these. But I figured, seeing how the art style is Japanese in origin, that I needed to draw at least one of my eastern characters in the style, and I have to say, I'm pretty pleased with the result. For anyone not familiar with the series, I drew a bunch of cast characters in the style of the Okami games a while ago, trying to mimic an ink and paint feel. I still haven't really figured out how to do that with solid lines (still searching for a good "ink" brush) but the hair usually turns out great thanks to a really neat brush I found that twists and bends around on itself. 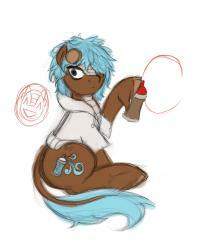 In this instance, I chose Ryuichi as my test subject because Neighpon and Shogun, but I had a lot of fun with this. I might try drawing my other eastern-themed characters in this style, because playing around with that twisty brush is just too much fun not to use it again and again and again! I'd been experimenting with a less detailed style to draw my various wolf yokai characters in. I think this design looks like she might be something fromt he show which was what i was going for! I might try and do some other yokai characters like this! Anyway, This is a mysterious yokai who has been seen hopping the rooftops of the metropolitan hotspot of Polohama in Neighpon. The few who see this creature make now that she is almost always surrounded by a haze of neon colored hitodama that usually appear as blue. There have been no instances of aggression from this creature but if you'd ever prowling the streets of Polohama at night keep your eyes pealed! 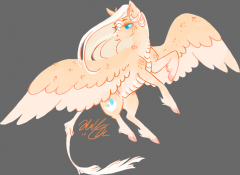 Showing off my sweet babs Chiasa and her fluffy sparkly wings. Not a princess really, more like a noble lady of an obscure family. She is my precious ballerina and will dance into your hearts. Full size is best size! Felt like trying to draw something that didn't just have a neutral resting expression, because that's really my default and I don't really experiment or draw emotions and expressions that often. Always good to get some practice on expressions! Neighpon is pretty much a mix of feudalistic and modern, and I imagine the role of the Shogun in times of war edges towards the modern side for the most part, except in cases of very important, large-scale battles. And in those instances, the Shogun shows up to fight for the country. I mean, even Celestia has been shown to fight in battles before. 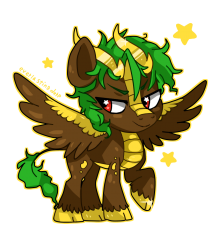 ...The Shogun doesn't have the power of an Alicorn, true, but I like to imagine that the power of moral and leadership are just as powerful as any old Alicorn magic, kthx. 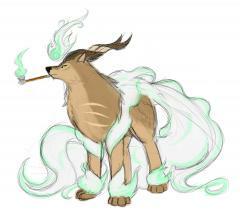 A yokai who predates the shogunate supposedly living in a mist covered mountain range north of MT. Kaminichi. 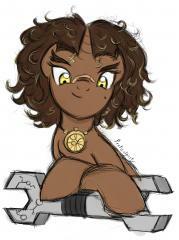 Stories about his ancient exploits have faded in folklore among the short lived ponies. 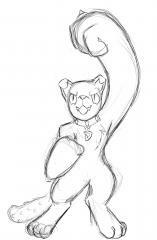 Legend has it he and and a great army of various yokai united to battle a dangerous and powerful Onikuma who stole his pack's land, defeated the great bear with the help of a pony. SOme folklore makes mentions fo various strange exploits he had gotten into all across the countryside and about fifty year ago he was seen seemingly rampaging through the countryside near Polohama in search of something before departing. I figured I should show off his Okami form for a bit since I'm rather proud of how I'm drawing other animals lately... also His mistcape is magnificent if I do say so myself. 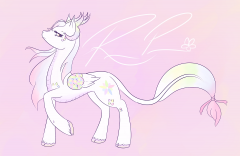 Among ponies and other races he is most commonly known as "Ookami no Taisho"
I'd always wanted to draw a MLP-style european unicorn, because I've always liked the look of them (deer-like, lion's tail, etc). Plus, a discussion in one of the Discord's chatrooms got me wondering if I could manage to color "oil spill" hair, which is basically a color palette meant to mimic an oil spill. Those two ideas eventually led me to sketch and then color out this design. Killing two birds with one creative stone! Overall I like how she came out, especially considering I was kind of experimenting with both the bodily design and the color design. She might end up on that theoretical list of OCs for adoption that I've always meant to put up, since I have no immediate ideas or plans for her. 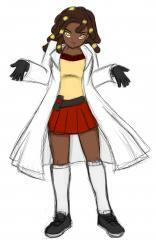 On the other hand, I do like how she turned out, so I might end up apping herself. For...something or other, I'm sure. Did another bevel avatar, might use this one soon. Yanhua, Head Chef of the Imperial Palace. Just as the title says! App Will come soon! This is Toboe, She's running a bar in Long Kong. Wow this took some time, I haven't drawn a wolf in years. Anyhoo, This is my yokai character with her shapeshifting/glamour off. She has a more G rated form that she's gotten by in but I'll link that another time. ... It's Balder! I've been working on this all day. Dubstep doesn't have nearly enough OC art or avatars so I have taken it on myself to remedy this as much as I can! First up: Balder. 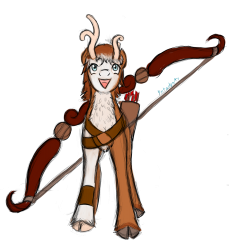 A cute, gangly bou from Clan Kare of Whitescar. He's been a fan of Sigrun of Askr for a while and has recently joiend her on a hunt for a special type of prey! Surely his skill with a greatbow will be instrumental in defeating a relatively recent foe! In the magitech hotbed that is the city of Polohame. There have been occasional sightings of a mysterious yokai popping up across the city. Strangely enough these reports tend to fade into obscurity as quickly as they come and rarely make it out of the city. 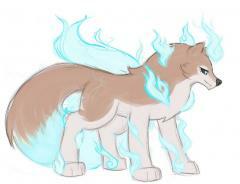 Sightings describe an Okami with a long mane and tail that gives off wisps of light and plasma not unlike the neon signs scattered across the districts. While it may have a habit of occasionally scaring the ponies who may have come across it... None of them have ever been injured. 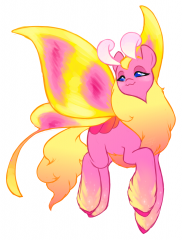 If somepony comes across this creature it would be wise not to try and take any pictures. Or else they may find them stalked by Polohama's Neon Demon. (Seriously, though. I think I FINALLY settled on a look for Toboe that I can stick with. 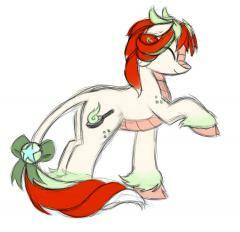 Working on a new Pony form too." Sadly he's taken! This is Mutt! Owned by @Mutt An adorable hero in the Age of heroes AU! "But Zeig, I thought your Yokai was going to be your last OC for a long while to come?" AHAHAHAHA...you thought. Dēnglong Xiu is the Imperial Wood Synergist for the Imperial Palace of Huangjing - essentially, a fancy way of saying she's the head physician of the palace. She's also rather unique among my OCs in being something of a doormat. She's not quite shy, but she's definitely more awkward than pretty much all of my characters combined. I don't usually play meek or "weak-willed" sorts of characters, but Xiu is definitely on the milder end of the spectrum...even if she does have her moments. Dat preview picture tho... Newest OC, an Okami Yokai by the name of Kamikakushi no Shinrin (who will probably start going by a nickname of some sort once he meets some ponies, but until then, Kamikakushi no Shinrin it is). Ever since the extended canon species thing started, I had the vague notion of apping a Kitsune. 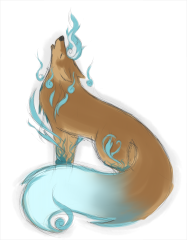 The idea died down quick enough, but randomly resurfaced with a vengeance the other day, and had morphed into an idea for an Okami. 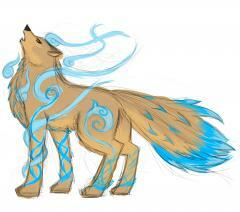 I like foxes, but wolves even more so, which is how I began a sketch that eventually morphed into this. 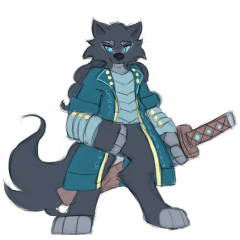 I also wanted to give him a look that wasn't completely wolf, since Yokai are not really animals, so I ended up drawing some inspiration from the Pokemon Suicune and Okami (the video game) for his design. Also kinda realized late that Kamikakushi no Shinrin's tail colors are eerily reminiscent of Yin's, at least the highlighted sections...BUT by the time I realized, it was too late. Ah well, still happy with the way he turned out! Check out them victory rolls. It's Sugar Blues! "Yeah, I'm being cute. What about it?" I dunno, I hadn't drawn Inkbrand in a while, I was bored, things happen. I take no responsibility for my actions. Yay, more Okami pictures with more eastern-themed characters. The hair kind of came out wonky on this one, but I decided to just leave be. When Mei lets her hair down, it falls in a straight line, so it's kind of hard to draw it billowing in the wind with the twisty brush I use for the mane and tail. Still, I like it better than my first attempt. I had initially planned to draw Mei with her hair done up and wearing an Empress' crown, because or her tendency to daydream she's an empress and such - but then I figured an Okami picture should be true to the character themselves, rather than what that particular character wishes they were, if that makes sense. It should be a picture solely of Mei, not a picture of what Mei wishes she were like. But that's all hooplah. The important thing is Ooookaaaamiii! 'Bout time for another one of these, isn't it? Yeah...yeah, 'bout time. These are the character log pictures for some newer characters of mine. The Ryuichi one is actually old (I just used the same picture for his character log profile rather than make a new one), though I realized that I completely forgot to include Dawnguard's picture in the last set I did. So, there he is now, poor guy. ...If you can't tell, I've developed a bit of a liking towards Longmas/Ryumas.